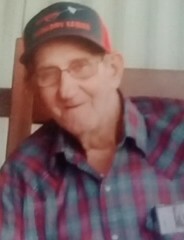 Mr. Marcus (Shop Boy) Seay, age 83, of Worthington Springs, Florida, passed away on April 11, 2019 with his family by his side. He was born on July 18, 1935 in Worthington Springs, to the late Leverette and Rosezell Willis Seay. He lived in Union County all his life and was a jack of all trades. He was a mechanic, welder, truck driver, and enjoyed playing the guitar and singing. He also enjoyed tinkering with his lawn mowers and fishing. He enjoyed life and enjoyed making people smile. As some of the family said, “He was a heck of a guy”. He was preceded in death by his parents, Leverette and Rosezell Seay, and by his sisters, Evelynn Todd, Yvonne Ferres, and Thyra Smith. He was survived by his wife of 62 years, Ethel Woodard Seay of Worthington Springs, FL; his sons, William “Billy” (Viola) Seay and Marcus “Cricket” (Bernice) Seay all of Worthington Springs, FL, and Cecil (Lisa) Seay of Bell, FL; his daughter, Loretta (Onny) Seay of Worthington Springs, FL; grandchildren, Cecil Wayne Seay, Dillon Seay, Harley Seay, and Lance Seay; two great-grandchildren; numerous extended family members also survive.